Here are some numbers from CVS Health's recent results that amazed me. CVS Health (NYSE:CVS) is on a roll. After it rang up more than $153 billion in total sales last year -- making it one of the largest retail operations in the world -- industry watchers expect the company's top-line to surpass $181 billion this year. That represents double-digit growth off of an enormous base, which is an impressive accomplishment for a company of CVS Health's size. I've been digging deep into CVS Health's recent financial results and have been blown away by just how big this company has become. Below is a list of 15 numbers that amazed me and might help you put this behemoth's size into perspective. 9,600: That's the approximate number of pharmacies that are currently in CVS Health's retail empire. This number took a sizable step forward last year when the company ponied up $1.9 billion to take over Target's pharmacy and clinic business, and the company continues to grow organically, too. Management has plans to net a total of 100 new store openings during 2016. 1,136: This is the number of in-store clinics (called MinuteClinics) that the company currently operates. These quick-service clinics are a big hit with CVS Health's customers -- revenue from MinuteClinics jumped 17.7% year over year last quarter, despite the company stating that traffic was moderate from a slow flu season. Management continues to see opportunity for MinuteClinic expansion and has already announced plans to get to 1,500 clinics within the next few years. 240,000: That's the size of the company's work force at year-end. CVS Health also retained 98% of the former Target employees that came to the company through the acquisition. 23.9%: That is CVS Health's retail pharmacy market share during the first quarter of 2016. That's up 245 basis points versus the same quarter a year ago, mostly because of inclusion of its Target acquisition -- but the company believes that it grew organically, too. That's a healthy lead over the 19.5% market share that Walgreens Boots Alliance boasted over the same period. 80 million: That's about how many members are covered by CVS Health's pharmacy benefits management (PBM) business. That's the second-largest network in the country, behind only Express Scripts. 97.3%: This was CVS Health's retention rate for its PBM customers last quarter. It's a remarkably high number that demonstrates just how much its services are valued by customers. 85.2%: This is the percentage of dispensed drugs from its PBM business that were generics in the first quarter. It was up 170 basis points versus the same period last year, and with more drugs losing patent protection each year and the rise of biosimilars, it is likely to keep climbing. $40 billion: That's how much revenue CVS Health pulled in from its specialty drug business in 2015, which was up 32% percent over the prior year. 19 million: This is the number of CVS Health's customers that have signed up to receive text alerts regarding clinic appointments and prescriptions. Management credits the company's continued fast growth with its investments in creating a better consumer experience and is in the process of rolling out curbside pickup, too. 1 million: That's the number of patients who have enrolled in ScriptSync, a program designed for patients with multiple prescriptions. Patients who utilize ScriptSync can pick up multiple monthly refills at the same time, thereby eliminating the need to make several different trips to the store. The program appears to be a big hit with customers as more than two-thirds of patients who have been offered ScriptSync have signed up. That's a pretty impressive results for a program that hasn't even been available for a full year. 21.9%: This is the percentage of front-store sales that were from CVS Health's store-branded products. This category was up 100 basis points year over year, and management is seeing so much success with its store brands that it has plans to enter a number of new product categories over time. 21%: This was how much the company's dividend was recently raised. Even with the payout bump, CVS Health sports a payout ratio of only 31.9%, which is a bit below its long-term target of 35%. That hints that investors should see another dividend boost next year. $2.1 billion: That's how much the company spent on repurchasing its own shares during the first quarter. In total, 22.4 million shares were retired for an average price of $98.52 per share, and management has plans to buy back another $1.8 billion worth by year-end. That should ensure that the company's share count continues to decline at a rapid rate. 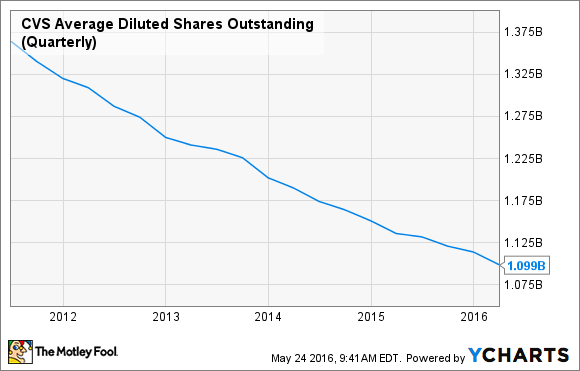 CVS Average Diluted Shares Outstanding (Quarterly). Data by YCharts. $5 billion: That's how much total capital will be returned to shareholders in 2016 through a combination of dividends and buybacks. Still, the company's cash balance is expected to grow this year, as management plans to throw off at least $5.3 billion in total cash flow for the year. 17.5% to 19%: That's how much total revenue growth CVS Health expects to show for the full year. Acquisition-related costs and slightly lower margins are going to curtail profit growth, but management is still guiding for adjusted earnings to fall in the range of $5.73 to $5.88. That's growth of at least 11% versus the prior year. Shares of CVS Health are currently trading for about $100 each, which implies a forward price-to-earnings multiple of about 17. With the company preparing to have another solid year, I think that's a great entry price into this healthcare giant.